What’s the connection between Judi Dench and a Shakespearean theater nestled in the scenic Shenandoah Valley in Virginia? The interior of Blackfriars Playhouse; photo by Lauren D. Rogers. The answer is that Dame Judi and her late husband, British actor Michael Williams, helped establish the Blackfriars Playhouse in Staunton, Virginia. 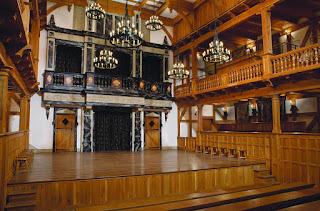 The 300-seat theatre is part of the American Shakespeare Center (ASC), an organization that celebrates Shakespeare and the dramatic arts through performance and education programs. In addition to a repertory company that performs at the playhouse, the ASC has a traveling troupe that goes on tour. It offers two-week summer camps for teens with a thespian interest. 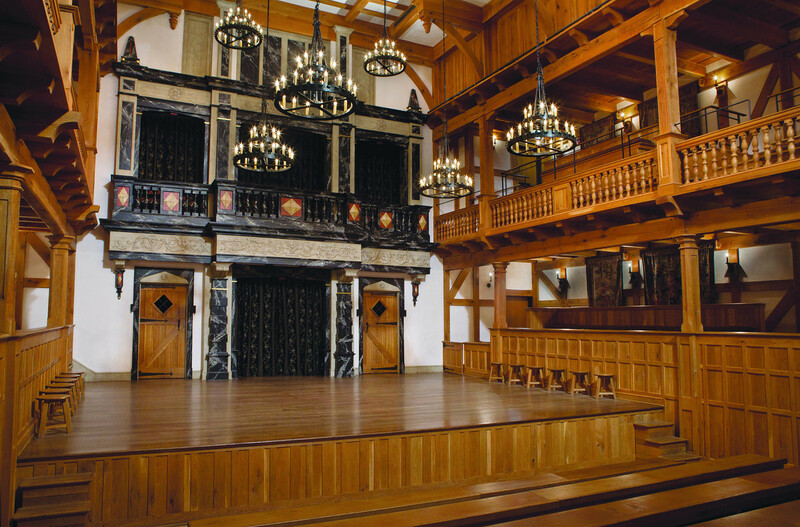 It also awards scholarships, provides education programs, and hosts the Blackfriars Conference in odd-numbered years for “scholars and practitioners alike to explore Shakespeare.” Click here to learn more about the ASC. 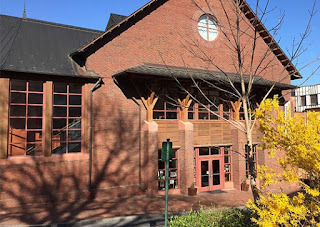 The exterior of the Blackfriars Playhouse in Staunton, VA. Some of the Café’s staff recently trekked to Staunton to experience the Blackfriars Playhouse for the first time. 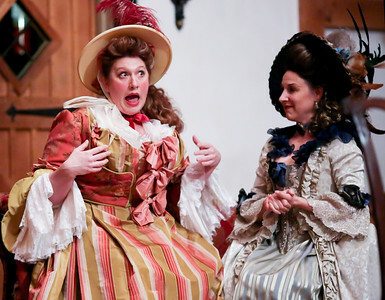 The recently-concluded Actor’s Renaissance Season featured two Shakespeare plays (The Merchant of Venice and Coriolanus), plus The Fair Maid of the Exchange, Shakespeare’s Sister, and The School for Scandal. Feeling a little scandalous, we opted to see Richard Brinsley Sheridan’s 1777 drawing-room comedy. It turned out to be a marvelous choice! There’s not a bad seat in the Blackfriars Playhouse, which seeks to replicate the experience of watching stage plays as they were performed in Shakespeare’s time. There are benches with backs on three sides of the stage, plus stools lined up on either side of it. There are no elaborate scenic backdrops and just a few props (e.g., a couch, a dressing screen). One of the actors announces the scene while fellow cast members rearrange the set. The theatre’s lights are kept on during the performance to replicate the sunlight under which actors performed in olden days. As for the costumes, we thought they looked fabulous. Creating a festival-like atmosphere, the cast members perform songs before the show and during the intermission. They often accompany each other with guitars, mandolins, and trumpets. Their song selection was wonderfully eclectic, with our favorite performance being a wry rendition of Warren Zevon’s Werewolves of London. Allison Glenzer as Mrs. Candour & Ginna Hoben as Lady Sneerwell. If you’re unfamiliar with The School for Scandal, it’s a laugh-out-loud comedy about a group of gossip-mongers, a rich uncle, and two brothers. The “good” brother is revealed to be a deceiver while the “bad” brother turns out to have some redeeming qualities. The highlight of the play was a portrait auction in which some of the audience members were handed empty wood frames and “became” the portraits by framing their faces. But heck, even the character names were funny (e.g., Lady Sneerwell, Benjamin Backbite, Mrs. Candour). With just a couple of exceptions, the cast of professional actors was outstanding. 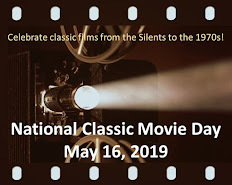 Our favorite had to be Allison Glenzer, who starred as both the giddy gossip Mrs. Candour and the (male) Jewish loan shark Moses. Incidentally, the actors also directed themselves! Stonewall Jackson Hotel in Staunton. In short, if School for Scandal represents a typical performance, then we heartily recommend the Blackfriars Theatre. 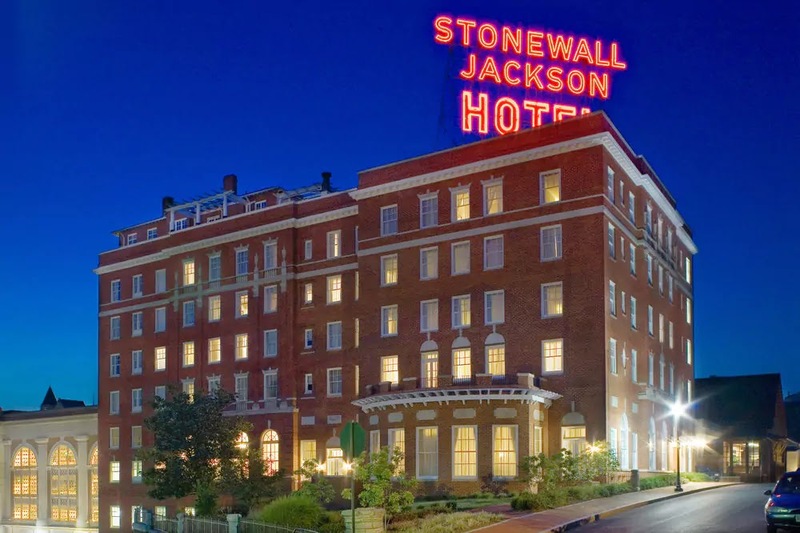 If you choose to spend the night in Staunton (which reminded us of San Francisco with its steep hills), then you might consider the historic Stonewall Jackson Hotel. It’s right next door so you can walk to the theatre. Michael Williams, who died in 2001, never had the opportunity to see the Playhouse. However, Dame Judi visited Staunton in 2004. According to the book Shakespeare in the Theatre: The American Shakespeare Center, she noted: “This beautiful theatre should be in England.” She still serves on the Center’s Board of Advisers. What a marvelous experience. It is the time of year for festivals and this sounds like you get more for your money. What a beautiful theatre! Though everything was minimalistic, it worked together wonderfully. The cast was indeed outstanding, with a couple of exceptions. And having the hotel next door was convenient for a downtown location. Definitely worth a stop!